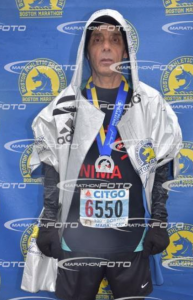 The “Retro Bandit” was identified after The 2018 Boston Marathon. 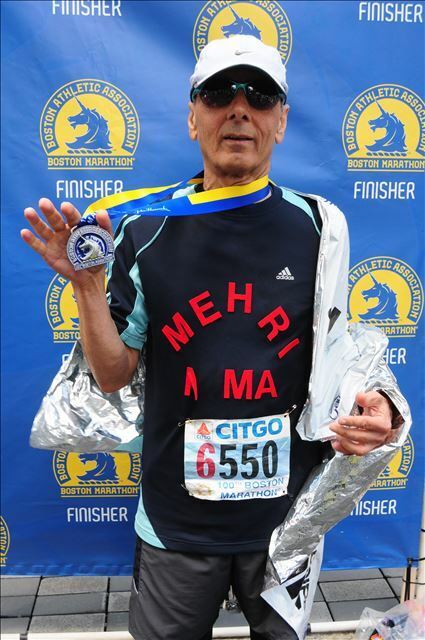 He earned the nickname for running (at least a small portion of) The Boston Marathon wearing a 1996 Boston Marathon bib. Further research showed that he jumped into the 2016 and 2017 Boston Marathons as well. He always claims a medal and poses for photographs. 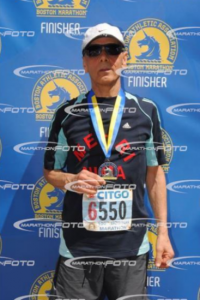 On Monday evening, while scraping the results of The 2019 Boston Marathon, one of the first things I did was to check to see if any photos were up on Marathonfoto.com. The first bib I checked was Bib #6550. Sure enough, there were photos of the Retro Bandit. The runner once again was shown on the course and in the finishers area. Photos show him with his medal, the mylar blanket, and a bottle of water. He clearly took advantage of services reserved for registered runners. Who is The Retro Bandit? Last year, at first, some readers were giving him the benefit of the doubt. Maybe he was legitimately registered, and was wearing the bib as a tribute of some sort? This notion was quickly dispelled. 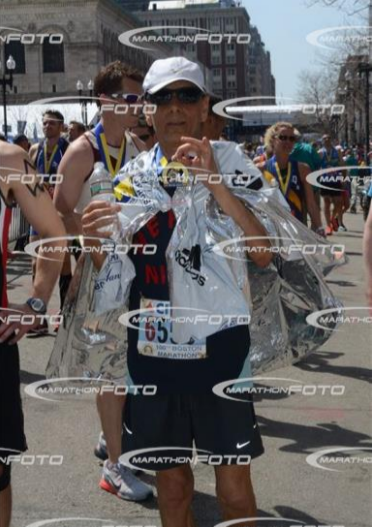 I was able to determine his finishing time based on finish line photos. The runner with the 1996 bib did not register at the finish. He did not have a legitimate 2018 bib. 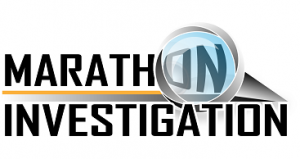 While 1985 Boston Marathon results are not available online, a reader of Marathon Investigation had a copy of the results . The owner of the 1996 bib was identified. Ali Eghlima, an MIT graduate, was the legitimate owner of the 1996 bib. He ran the 1996 Marathon in a time of 3:05:54. It has been confirmed that Ali is the Retro Bandit. According to Athlinks, 1996 was his last official race. He also appears in the 1989 and 1995 Boston Marathon results. A source had previously confirmed that Ali is on the BAA’s banned runner list. But, banning a bandit has little effect. This also shows how easy it is, despite increased security, for anyone that is so inclined to jump on the course and cross the finish. Not that they should but why can’t they prosecute this as disorderly conduct ? I saw this guy yesterday from the crowd, that bib stood out a mile. Im very surprised noone pulled him out at the finish chute. He was with red wave finishers who were better runners than he looked. There was another guy around the same time who looked fake too, with a jacket obscuring some of the bib. I admire his persistence. Same shirt and hat every year. Same bib from 23 years ago (and one that doesn’t even LOOK like the ones now, ie different sponsor!). 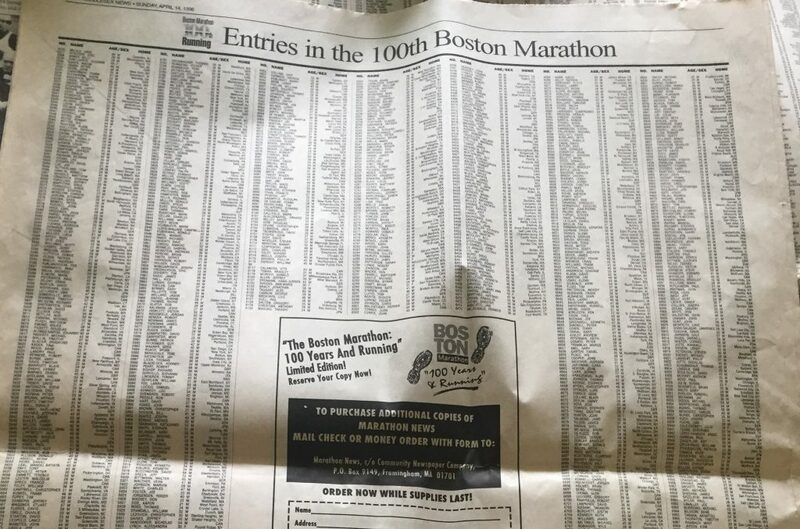 To pull off this ruse every year and to pull it off at the “holy grail” of the Boston Marathon is actually kind of funny. 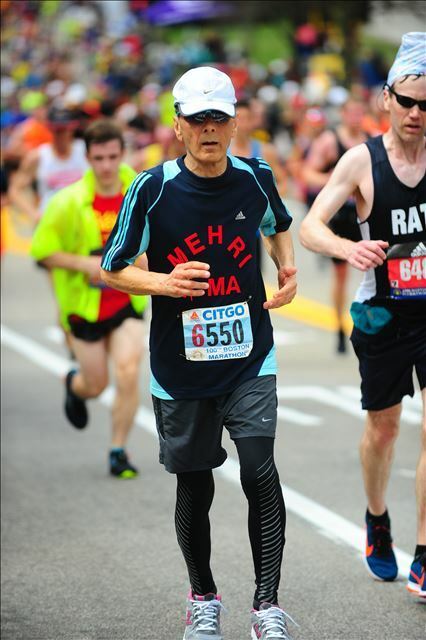 I imagine it’s quite infuriating to those who think of Boston as the one true marathon to see this guy pulling this off…which to me makes it even funnier. That being said…someone needs to put a bounty out for this guys capture next year. Its obvious he likes his photo taken, so maybe tell the race photographers that they’ll get a reward next year for finding him next year and holding him for a BAA official. So much evidence, I hope he is charged with theft of services! Pathetic! If Jock Semple was still alive, he could tackle the dude and redeem his legacy! I live in the Newton Hills and always go to mile 20 to watch the runners. I spotted a handful of bandits (no idea where they’d jumped in), and a fair few red bibs in with the blue and yellow bibs. Out of curiosity I checked the finish time of one them and it was just under five hours. Seeing as his qualifying time would have been under 3hrs 07mins, I’m definitely suspicious. It was hot AF out there later. I saw a red bib or two as well, and I was wave 2, 3:53 finish. I struggled as well. I also know runners with red bibs who run with someone else in a slower corral, run it for fun, or are injured. Please don’t judge the bib color unless you know the story. I ran last year and it was very likely you would have seen me in this exact situation at this exact spot (red bib mixing with the yellows at mile 20). The reason? Three weeks before running Boston I injured myself. There was no way I was going to skip running Boston, but it was my slowest marathon ever. Many more people just take a victory lap at Boston. It is a hard course, and at a time of year when many people find it difficult to put in the training. So they go, run, and take in the atmosphere but run a relaxed race. I think Derek has written about this kind of thing before – some people evenly pre-emptively write him to let him know there will be a discrepancy in their times (which, in itself, is worthy of an essay about the power of this platform and the potential for its abuse). You really need to look at the individual’s qualifying race and their other history to make a more informed judgment about whether or not they should have legitimately been there. Thankfully Derek does a pretty good job at all of this before publishing. I ran on Monday and might have seen this odd pair as well. Around mile 22 I came up behind a man and kid who looked to be around 11-12 years old running rather slowly. I was wondering why they weren’t escorted off the course. I could very well be the runner (or one of) the runners you’re talking about CJ of the Newton Hills. Red bib. 7110. Qualifying time around 3:05 or 3:06. But ran a 4:24:40 on Monday. and I only ran 9 miles in April before raceday. That’s an AVG weekly mileage of 10.75 miles/week. 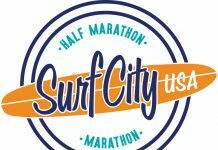 I don’t care if someone’s PR is 2:44 for the marathon, 1:18:00 for the 1/2 and 14:20 for a 5K – they’re going to run a 4hr+ marathon with that kind of training. Which is exactly what I did. Nope, it wasn’t you. And congrats to you on finishing. I’ve never run a marathon, but going by my half-marathon times I reckon I’d just about manage a sub 5 hr time. The guy I saw stood out because his physique didn’t look like that of a three hour marathoner. I can see how difficult it is to police bandits – people jumping in without bibs (might even be legal for anyone to run on the course) or with counterfeit bibs or prior year bibs, but seems they should be more careful about handing out finisher medals. Do they just pass them out to anyone who crosses the finish line with a bib? If Boston is like most other races, then it’s mainly volunteers handing out the medals. If there is a crush of runners, I imagine the goal is to just keep people moving and after awhile, it becomes rote — runner crosses, runner gets a medal. Plus, I’m sure not a lot of volunteers would be comfortable with challenging a runner. I think it was last year, but MI had a feature and video of course officials positioned at and near the finish looking for cheats at a race. (I want to say it was in Hawaii, but could have been overseas.) If those so identified could not produce verification, a course marshal took back the medal. Maybe that should be tried here. Won’t catch ‘em all, obviously, but some is better than none. But all this begs the question: If it is conclusively proven that this guy is a serial bandit, and BAA is made aware, why doesn’t the BAA pursue theft of services charges? That could be a deterrent in and of itself for some (not all) who are considering doing this and think it is no big deal. I agree Mark. Have a few officials located at the finish line and if they cannot produce a legitimate bib, then they have to give the medal back. Period. At a minimum, I feel like the local authorities could charge him with petty larceny, depending upon the value of the medal, blanket, water, etc. so long as the race is willing to press charges. Not only does he wear the same bib, it appears he wears the same shirt and shorts every year too! It’s like he’s trying to relive the 1996 Boston race every year. This guy needs to be stopped. I’m very surprised no one notices things like a bib that’s not current, or if they notice, no one’s reporting this kind of stuff to officials. By the way, congratulations to all the legit finishers in this year’s race. Maybe he thought his genuine entry, from back in the day, was like those refillable drinks where you can come back again for a free refill! How does that joker get more than a few miles on the course, or even if that, not get nabbed at the end? That bib looks nothing like a current one. Anybody know why he wears that shirt? Google translate says it means “What’s love”. BAA could charge him with larceny or trespassing, but then they look like bullies. I’m surprised they haven’t tried to issue some sort of a restraining order at least. QR code on the bibs? To get a medal, you get it scanned? Limits to only one medal per valid bib. Would slow things down at the finish though. Probably more effective to just have extras and assume bandits will show…sadly. That’s a great idea (QR code). 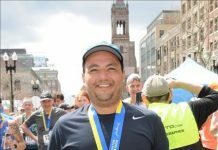 I ran Boston on Monday for the 3rd time and it would be easy to jump on the course based on what I’ve seen. I also think it’d be easy to get multiple medals if you were the kind of person that would do something like that. The line of people handing out medals is really long. I’d guess they have 30 people or more handing them out. That was a very bipolar weather day. This guy doesn’t look like he suffered through it. I ditched my shirt after mile 18 and carried my bib or had to tuck it in my shorts. Probably Sasquatch sightings all over New England. The way I see it I WORKED that day (longest day of my life), but sometimes there can be extenuating circumstances for missing timing mats. Hope I wasn’t one of them. Wonder if shoe chips are more accurate? 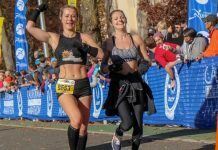 Having run a multitude of Boston and New York City Marathons, it seems that it’s more difficult and more frowned upon for imposters to get into the finish area of NYC. Tokyo Marathon has figured out the QR code deal. When you get to the expo, they verify your passport and issue you a bracelet with a QR code and take your picture, you can’t get into the starting coral (at least not legally) without getting your bracelet scanned and verify identity against the picture, and then at the finish they scan your bracelet before giving you a medal.. The have HUNDREDS of volunteers with electronic scanners checking, so it’s surprisingly not a huge delay getting in to the race. Now, of course you *could* still buy a bib and cut/re-tape the bracelet on you after it’s been legitimately picked up.. but it would be tough to get through the starting security, and finish line ID check.. but you could do it if you were determined enough.